Cyprus based Prodigal Earth's 'Zenith II Zero' is the second release from the island's young and upstart label Pitch Black Records. If this debut is any indication, then Pitch Black is not only on to something good, but also on a straight path to discovering some great talent as they grow. Prodigal Earth is extremely talented and professional, and 'Zenith II Zero' is a genuinely exciting platter of melodic heavy metal. Rarely, do you find a young band's debut this impressive (another recent example is Silverlane's debut 'My Inner Demon'). I can honestly say that I found not a single dull moment on 'Zenith II Zero.' From beginning to end I was increasingly captivated and impressed by Prodigal Earth's ability to deliver classically born melodic heavy metal with positive doses of power metal and, here and there, a little thrash. On the power metal side 'Broken World' and 'Once Upon A Time' instantly qualify, but are never overpowered (pardon the pun) by it. The former is blessed with an intensely catchy melody and chorus, the latter by it's full use of keyboards and mixed tempos. For a slight dose of thrash, the opener 'Disaster 121' has you covered. Yet, even this is made better by the steady and speedy pace of the rhythm section and the clever vocal arrangement. The common foundation and strength of 'Zenith II Zero' is the melodic metal which Prodigal Earth so effortlessly performs. It's those particular songs, like 'Crossroads,' 'God's Children' and 'Will To Live,' that captured my musical attention and also convinced me of Prodigal Earth's abundant and ambitious talent as new band. Additional strengths come in the vigorous vocal performances, guitar solos, intelligent lyrics, and clear production. 'Zenith II Zero' is an impressive melodic heavy metal debut from Cyprus' Prodigal Earth. Their initial work succeeds on several including genre-busting creative arrangements, skilled musicianship, and clear production. 'Zenith II Zero' is both classic and fresh, a positively enjoyable effort by Prodigal Earth. Very recommended! 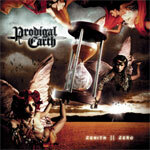 'Zenith II Zero' is an impressive melodic heavy metal debut from Cyprus' Prodigal Earth. Their initial work succeeds on several including genre-busting creative arrangements, skilled musicianship, and clear production. 'Zenith II Zero' is both classic and fresh, a positively enjoyable effort by Prodigal Earth.